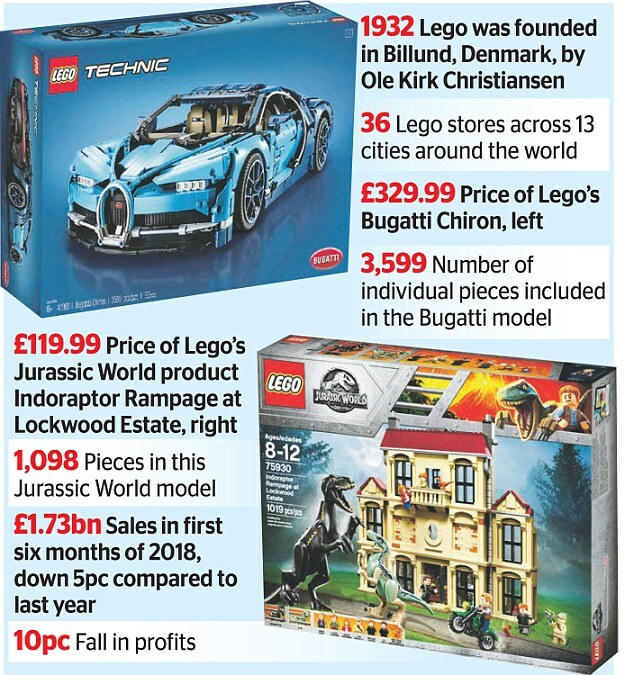 Lego’s sales and profits continued to crumble despite demand for its Jurassic World and Bugatti sports car models. Sales at the Danish toy maker dropped 5 per cent to £1.7billion in the six months to June as profits fell 10 per cent to £506.8million. Demand for Lego’s brightly coloured plastic bricks came to a standstill last year after more than a decade of strong growth, and the toy maker was forced to cut 1,400 staff. A further setback came when one of its major customers, Toys R Us, went bust earlier this year. But demand for its Jurassic World sets and a £329.99 Bugatti sports car replica has helped to stabilise sales, the firm said. It will also open two flagship stores in China this year and in 2019, adding to its 36 shops around the world.